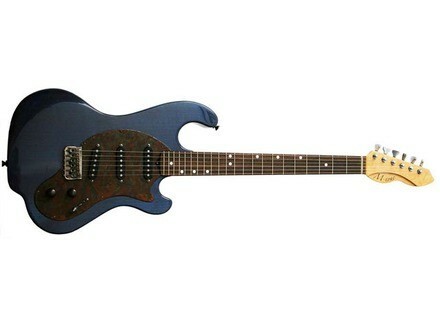 Stackpole, Other Shape Guitar from M-Tone. M-tone Guitars will be launching at the NAMM Show. Slipstream - Mahogany body. Two P-90 pickups. Owner/builder Matt Proctor will be introducing the three electric guitar models, the Slipstream, the Dynamo and the Stackpole. M-tones are designed to have "super long sustain and are very punchy and articulate with great note separation," the company says. Dynamo - Alder or mahogany body. Two pickups: Humbuckers, P-90s or single + hum. Matt designs and hand builds a limited number of electric guitars each year in his Portland, Oregon workshop. Stackpole - Alder body. Three single coil pickups. M-tone's start at $2,500 with $100 up charge. Each guitar comes standard with hard case or Mono Case gig bag. [NAMM] Fret King Black Label Series Fret King will officially launch its Black Label Series next Thursday at the 2012 NAMM Show 2012.